Near the top of the world, plants grow on soil that rests atop permafrost, or permanently frozen soil. Just like plants in warmer regions, these need nitrogen to grow. The unique aspects of the permafrost environment create new challenges for representing plant-nitrogen interactions. Scientists measured how nitrogen availability to plants varies spatially and temporally in the Arctic tundra. They found that soil moisture plays a big role. In drier areas, nitrogen is present, but in the wrong form for the plants to use. Thawing permafrost increases soil moisture late in the growing season, but the newly available nitrogen near the permafrost boundary isn't available to roots. Arctic models should not assume that increasing thaw depth with warming of the Arctic will release additional nitrogen to the benefit of plants. Increased production of inorganic nitrogen that is not coupled to plant uptake could lead to nitrogen losses from the system and degrade the ecosystem. In the Arctic, the amount of nitrogen available strongly influences plant productivity and distribution. In permafrost systems with patterned ground, the amount of nitrogen and other nutrients available can vary substantially over short distances. Researchers need to better understand fine-scale spatial and temporal variation in soil nitrogen availability to more accurately predict tundra responses to a warming climate. Scientists from Oak Ridge National Laboratory measured plant-available inorganic nitrogen at multiple soil depths in 12 microhabitats. These habitats were associated with a gradient from low-center ice-wedge polygons to high-center polygons in coastal tundra. The team took these measurements at the Barrow Environmental Observatory in Utqiaġvik (formerly Barrow), Alaska. They measured vegetation composition, biomass, nitrogen content, and rooting depth distribution. In addition, they measured the soil temperature, moisture, pH, and thaw depth. The measurements let them determine relationships between the spatial and temporal variability in nitrogen availability and environmental and vegetation drivers. Soil moisture was the primary determinant of nitrogen availability. Drier habitats had more of their nitrogen in the form of nitrate, not ammonium. The plants, however, could not use this form of nitrogen. 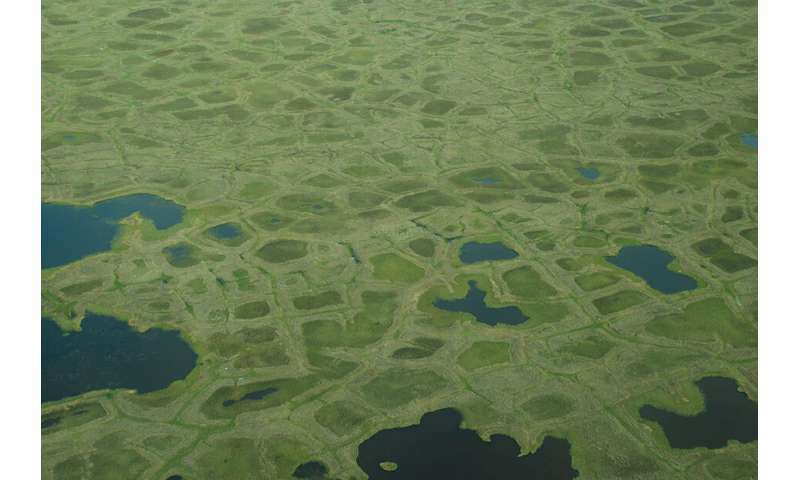 Although more nitrogen becomes available as the soil thaws in the summer, the newly available nitrogen, located near the permafrost boundary, is not available to the plants. The nitrogen thus offers no boost late in the growing season. Soil moisture, inorganic nitrogen availability, and plant nitrogen content are strongly related. Thus, delineating soil moisture levels and other changes related to thawing permafrost is vital to determining how the nutrient cycle in tundra landscapes will respond to a warming climate.